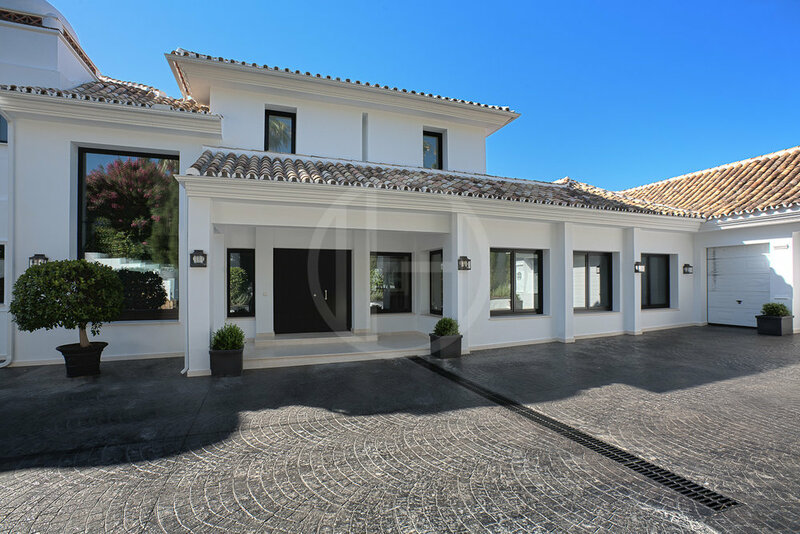 Incredible contemporary classic villa totally refurbished to the finest of standards in 2010, and fitted with state-of-the-art domotic system, this property is being offered totally furnished and in impeccable condition. The villa offers 6 bedrooms, 7 bathrooms, open plan living and dining room with gas fireplace, splendid covered terrace, modern fully fitted Whirlpool kitchen, office, laundry room, storage, electrics room and garage for 2 cars and 2 buggies. There are two master suites enjoying a complete bathroom with bath, separate shower, large wardrobes and access to a private terrace. Further more this property offers perfect entertainment with a magnificent home cinema, gymnasium with Turkish bath, massage area and shower room as well as an exterior heated swimming pool with cover and led-lighting creating various moods. The domotics system combines the best design with the highest sophistication but at the same time is user friendly and controls the gasoil UFH, A/C hot & cold, interior alarm and camara system, different light moods, multi-room integrated sound system, multi-room satellite system, all of this at the touch of your iPhone.